Fall is quickly approaching, and I keep trying to decide on what purse I want to be my primary "fall bag". I thought this decision would be easier once Initials, Inc.
Now, I can't decide between two distinctly different bags. 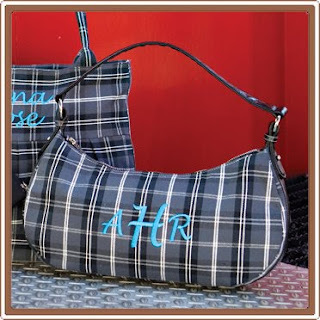 ORthe Hobo in Berkley Plaid with RED monogramming???? I like the pliad, but its small. Tough call, because. you're right, they're so different! Definitely the houndstooth!! It will look so stylish, especially with a red monogram!! I like the Hobo bag, but it looks a little small to me? I say - get both! 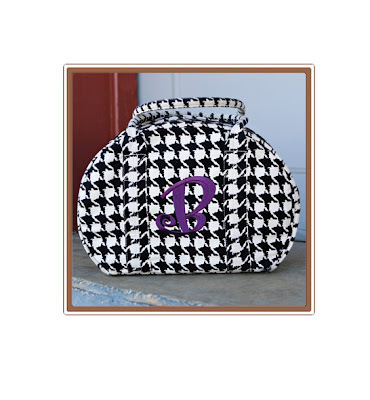 I like the houndstooth...My primary fall bag will be the black La Pliage bag by Longchamp--a workhorse bag! Both are absolutely adorable but my decision is the Berkley plaid with red monogramming. Very chic and classy. But I'm 100% honest when I saying that you can't go wrong with either bag. Cute website. I love the mail candy (monogram stationary). I like the pliad, but its small. I prefer to get both.